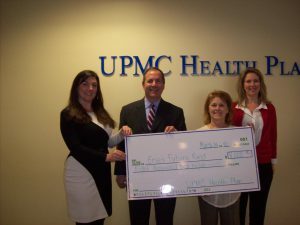 Our sincere thanks to UPMC Health Plan for their donation of $5,000 to the Erie’s Future Fund scholarship program. Partner donations ensure that quality preschool scholarships are available for 3 and 4 year olds in Erie County. Thank you Dr. Joyce Miller! 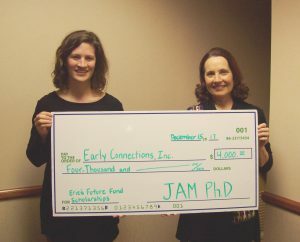 Many thanks to Dr. Joyce Miller for her recent donation to the Erie’s Future Fund Scholarship Program. Dr. Miller is a longtime community champion for quality early care and education in the Erie region. Pictured Left to Right: Kimberly Beers, Erie’s Future Fund Scholarship Director; Dr. Joyce Miller, CEO, Northwest Institute of Research. Thank you Lilly Broadcasting, for the $5,000 Pre-K EITC donation! Proceeds will help Erie’s Future Fund’s Summer Scholars, a program that provides scholarships for children from low-income families to attend high-quality programs that offer educational activities and nutritious meals during their attendance in the summer months, and funding for scholarships to children from low-income families to attend a high-quality early childhood education program in Erie County during the school year. Our sincere thanks to Erie BANK for their donation to Erie’s Future Fund Preschool Scholarship Program. It is with tremendous gratitude that Erie’s Future Fund, administered by Early Connections, Inc. announces the sixth year of partnership with The Erie Insurance Group. We thank you for your considerable donation which will directly benefit our Erie’s Future Fund preschool children and their families. Erie Insurance’s generosity will help provide Erie’s Future Fund scholarships during the school year and summer scholar program! 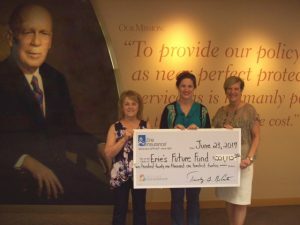 Pictured from left to right are Darlene Kovacs, Executive Director of Early Connections, Kimberly Beers, Scholarship Director, Erie’s Future Fund, and Ann Scott, Manager of Community Outreach & Human Resources at Erie Insurance Group. Thank You Klein Plating Works! 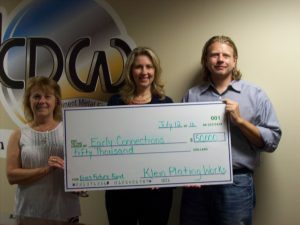 A big thank you to Klein Plating Works for their recent donation to Erie’s Future Fund! 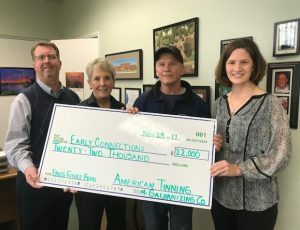 Pictured from left to right: Darlene Kovacs, Executive Director, Early Connections; Michelle Harkins, Associate Executive Director, Early Connections, and Joe Dudenhoeffer, President, Klein Plating Works. 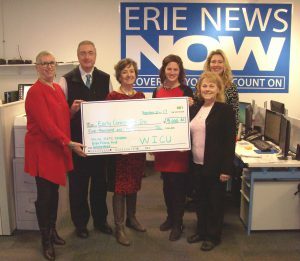 Thank you Erie Insurance Group, for your continued partnership with Erie’s Future Fund! The Erie Insurance Group has been an Erie’s Future Fund partner for five years – On behalf of Early Connections and Erie’s Future Fund, our scholars and their families thank you for your generosity. Erie Insurance’s recent generosity will not only help fund scholarships during the school year, but also Erie’s Future Fund’s new Summer Scholar program! 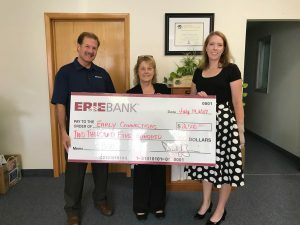 Pictured from left to right are Troy Peterson, VP Contact Center Operations, Erie Insurance Group; Darlene Kovacs, Executive Director of Early Connections, Michelle Harkins, Scholarship Director, Early Connections, and Michael Plazony, Senior Vice President of Erie Insurance’s Life Division. 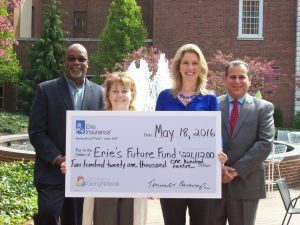 Beginning in 2016, Erie’s Future Fund will offer a Summer Scholars program. The Summer Scholars program will provide summer scholarships, allowing eligible children to attend a high-quality early childhood education program for three half-days a week. Eligible families can choose from a participating high-quality program, enroll their child, and Erie’s Future Fund will pay for three-half days a week, up to eleven weeks, during the summertime. Current Scholars: Parent or Guardians must call Erie’s Future Fund (814) 874-0144×15 to reserve a spot for the Summer Scholars program. May 2 through May 6 is reserved for current scholar family summer registration. Current Scholars may call after May 6, but the Summer Scholar program applications will be open to the public. We will confirm your scholarship within a week of your phone call. New Scholars: Contact Kim Beers at Erie’s Future Fund, (814) 874-0144×15 after May 6th to make a quick application appointment. Eligible families will be able to choose from a list of quality programs and enroll their child. Have a child that will be attending kindergarten in one or two years. Please contact the Scholarship Director for further age requirements. Erie’s Future Fund Summer Scholars Program was made possible due to the generosity of our partners. Thank you for giving more children in Erie County a chance to learn and succeed this summer! Erie’s Future Fund also wishes to acknowledge the following four organizations below for their leadership, support and implementation of the fund: United Way of Erie County, Erie Community Foundation, Pennsylvania Early Learning Investment Commision, and United Way Success By 6, administered by Early Connections. In addition, we are grateful to our donors who have made this fund possible. For a full list of current donors, please contact Darlene E. Kovacs at Early Connections, (814)874-0144. Thank you UPMC Health Plan! 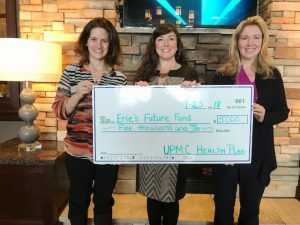 Thank you UPMC Health Plan for your recent donation to Erie’s Future Fund. UPMC Health Plan’s donation will not only help fund scholarships during the school year, but also Erie’s Future Fund’s new Summer Scholar program!